by Elizabeth Esten Throwbacks to 1980s cinema have become more popular recently, and whenever these films come out, they bring me such joy. Unfortunately, many flop at the box office and end up going unseen by the masses — even if they happen to pop up on Netflix later. In a deluge of poorly done remakes and homages to this great decade, Adam Wingard’s The Guest shines as a bright example of what nostalgic films should strive for, deftly mixing genres while evoking the 80s feel. David Collins (Dan Stevens) is an American soldier just released from a military hospital in Afghanistan. He immediately goes to visit the Peterson family, whose son Caleb died in combat. David’s taken in by the family’s grieving mother, but something strange begins to take place: bodies are piling up. As these violent acts continue to occur, it’s up to Anna (Maika Monroe) and her little brother Luke (Brendan Meyer) to solve the mystery and discover David’s true origins. Prior to this film, Wingard was largely known for horror movies. He directed 2011’s indie slasher hit You’re Next and participated in a handful of horror anthologies, including both V/H/S movies and The ABCs of Death. The Guest has the structure of a classic horror film from 30 years ago, but what makes it stand out is the style of its pacing and editing. The pacing resembles classic thrillers like 1981’s Blow Out, with well-directed action sequences perfectly spread throughout the narrative. Perhaps the most memorable of these action scenes is the fight in the bar between David and a group of jock students who repeatedly bully Luke. The slow buildup adds incredible tension, especially with the help of the score. This is also one of the first extended sequences where we see the brilliant duality of Dan Stevens’s David. When Stevens left the cast of Downton Abbey back in 2012 to pursue a film career, many people wondered if this was a good idea or a far too risky move. The Guest is evidence that Stevens’s risk was worth it, and he is one of the best young actors working today (regardless of that one time he co-starred in an Adam Sandler comedy). David is fascinating from the very first moment you see him. One minute he’s a smiling and charismatic young man with unmatchable charm, and the next minute his eyes reflect nefarious intentions. Stevens brilliantly creates an antihero you don’t know how to feel about at first. Soon enough, the audience and the other characters begin to see David for who he truly is. The plot twist involving David’s origins is intelligently revealed as well. But Stevens isn’t the only standout in the cast. An unknown at the time, Maika Monroe (It Follows) shows a huge amount of potential in her role as Anna, the eldest of the Peterson children. From the very beginning, she’s suspicious of the reasons why David is staying in her house, but she later begins to fall for his charm (but especially for his abs). As the film progresses, Anna becomes the only one who can stop the unnecessary violence. Anna isn’t complex, but Monroe brings a realistic feeling to what could have been an unmemorable character. A big aspect of Anna is her fixation with ’80s and ’90s music and this part of her character contributes to a foreboding soundtrack that creates a compelling mood and sense of urgency. Composed by Steven Moore (The Mind’s Eye and V/H/S 2), the score for The Guest is some of the best film music of 2014. Largely made up of synth sounds and featuring a few songs from the late ’80s and early ’90s sprinkled throughout, it captures the feeling of a John Carpenter flick in the vein of Escape From New York. Moore’s music has an intensity to it that causes a great sense of danger to hang over the film. 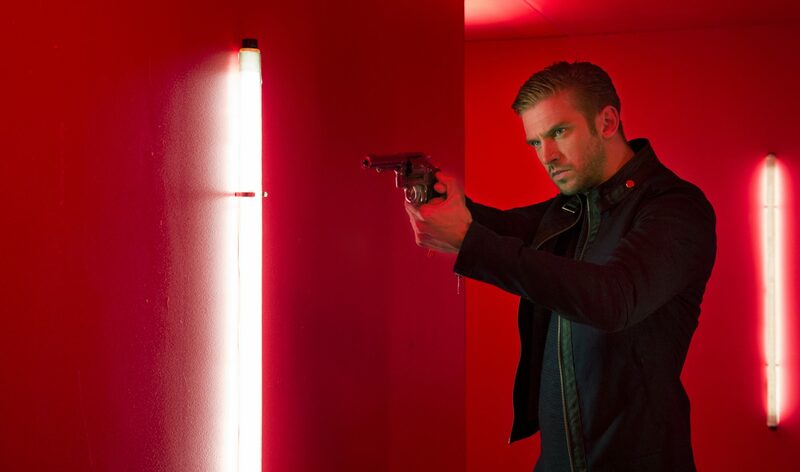 The Guest is one of the best thrillers of the past 10 years. With excellent pacing, outstanding performances and some incredible score work, Adam Wingard shows exciting potential in both the horror and thriller genres.